How, precisely, do you have access to this level of granular, ostensively private, data? my advice is, if you don’t get one from ISM, then ask. I notice varying levels of service fro handshakes and hellos to dropping paper, water etc in seat along with express pass (pre boarding), then no contact. Agreed, while the personal greeting is nice to have (and it doesn't bother me at all if i don't get it) the landing cards for Australia are pretty useful at times. I ask (discreetly and not in a DYKWIA way!) if they don't hand them out. Its never been a problem and they happily provide it. We all just got the welcome, cards and express ticket wlg to Sydney. In fact they’ve done them the last three trips I think. I thought everyone got got the landing cards? Sorry! My typo, i mean express cards!!! yes of course everyone gets the landing cards!! 12 people in the whole lounge. Perfect time to be here! Wouldn't work due to the number of Elite pax now. It would have to be BP only. In recent months they've even stopped Elite welcomes TT (and arrival passes) simply because of the number of Elite pax on some flights so there is no time - it's not uncommon now to have up to 1/3 of pax on TT A320 flights to AKL being Elite. Which is similar to domestic flights within the U.S. when you look at the board and see 86 people awaiting upgrade. At some point the system becomes absurd. I saw the PIL for my recent NZ TPAC (I was also curious how my name and info appeared). I see them all the time on AC and other airlines where the sheet is taped to a wall etc in the front galley. This is more often used for the galley FAs to note if someone wants to eat their main meal later in the flight or if I ask cabin crew to not serve the full meal, that I only want the salad and dessert for e.g., they note it on the PIL. In some cases, the in-flight cabin managers (different titles on each carrier) will have it on their iPads/tablets. It will be a similar grid and may show status color-coded. not sure how we get to this logic given that QF is substantially larger than NZ and has a much larger total FF base (and you would therefore assume more elites). Given QF manage to give First Lounge access to all Platinum (NZ*GE equivalent) and above, it would stand to reason that Air New Zealand could do this at least at their main hub airport. To me it’s just another example of how AirNZ like to talk about how “innovative” and “industry leading” they are and how “customer focused” they are, but in reality their customer focus relies on hiring nice staff. Don’t get me wrong - they are a decent airline by most standards, but they should really stop taking NZ loyalty for granted and actually invest in the customer experience. They charge premium prices - they should offer a premium product. "BTW, on AC, it is also used when taking meal orders as AC status (pecking order if you will) matters." Air NZ lounge sending people to Strata on Saturday am - the one person i saw and his family being directed was using lounge vouchers. I went in Saturday just before NZ8 and actually asked to go to Strata since could barely find any seats in the lounge! 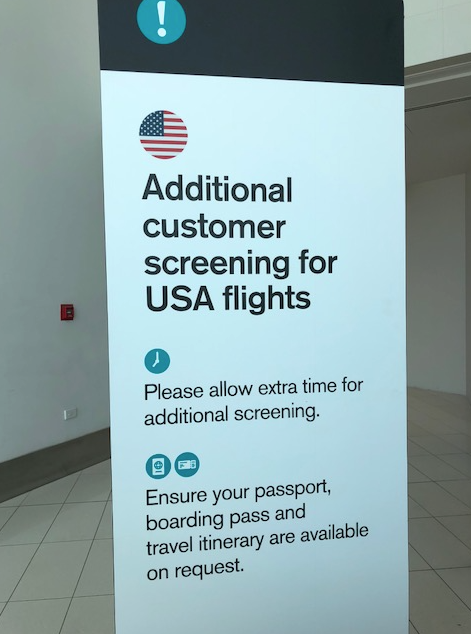 Then there was a long long line up for the US flight security interviews -- I'd just been on a United operated flight LHR-SFO a couple of weeks earlier and this wasn't a thing (just people with ''ssss" being secondary screened. I wonder why New Zealand is taking a more intense approach? I wonder why New Zealand is taking a more intense approach? It is what the US wants, New Zealand doesn't have a say in this.